Not sure what the best Xbox backwards compatible games are? Here's something to try. It never gets arduous killing demons. They truly are the guilt-free hack and slash targets of choice when it comes to satisfying a digital bloodlust. That said, it wasn’t until Bayonetta that I discovered equal satisfaction in button-mashing angels and deities back up into the heavens. It’s possible I simply lack sympathy and basic respect for anything on-screen that isn’t me, or that the grace and poise Bayonetta displays throughout the first instalment of her self-titled pound-athon has me showing more compassion for the next intricate attack combo than the poor soul on the receiving end. ‘Late to the party on this’ may be understating a touch, seeing as Bayonetta pirouetted her way onto the Xbox 360 back in late 2009, but it did give me plenty of time to cleanse the palette. My last dive into the chaotic hack and slash arena being Devil May Cry 4 back in 2008, which was appropriately the model upon which game director Hideki Kamiya shaped Bayonetta both stylistically and mechanically. That is where most similarities end however, with Kamiya’s creation of the original Devil May Cry seeming little more than a rough sketch, with Bayonetta his true genre-defining masterpiece. 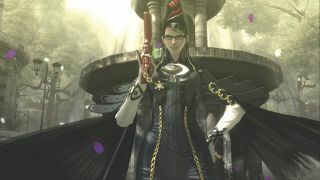 At a surface level, the game centres on the ancient theological struggles between dark and light, or more accurately, the angelic ‘Lumen Sages’ and the demonic presence of the ‘Umbra witches’, of which Bayonetta is one. I had to hold on tight to this plot point, for my narrative compass began going haywire from all the crazy that lay beyond. In short, the story is driven forward by Bayonetta’s desire to retrieve an ‘Eye of the World’, one of which she currently holds. These are powerful, elusive relics that she seems to not really need given her ability to summon demons, fire pistols with her feet and German Suplex angelic guardians with her apparel woven from her own hair. But hey, we all need a reason to get up in the morning. Combat itself centres around several basic one-button attacks; namely your standard dodge, punch, kick trio. I can rattle off numerous games that run a similar ‘mash and hope’ system, but it’s the momentum and scale of these attacks that leave you feeling satiated. A basic combo can send Bayonetta flipping out of the reach of angels while a giant incantation of her boot emerges from another realm to crush them into a fine red paste. Yet no matter the intensity of battle, Bayonetta always seems camera-ready, as if she is constantly anticipating a swarm of paparazzi to descend upon her. Honestly, take a screenshot any moment she is on screen and you’ll feel a future in photography beckoning.